There are various procedures for evacuating less physically able people from large multi-story buildings. Please speak to our Safety Consultants about the best method for your situation. Safety First are New Zealand suppliers of the EvacuLife Escape Chair, and provide training on use of the Evacuation Chairs in an emergency. Why does your organisation need an Emergency Evacuation Chair? 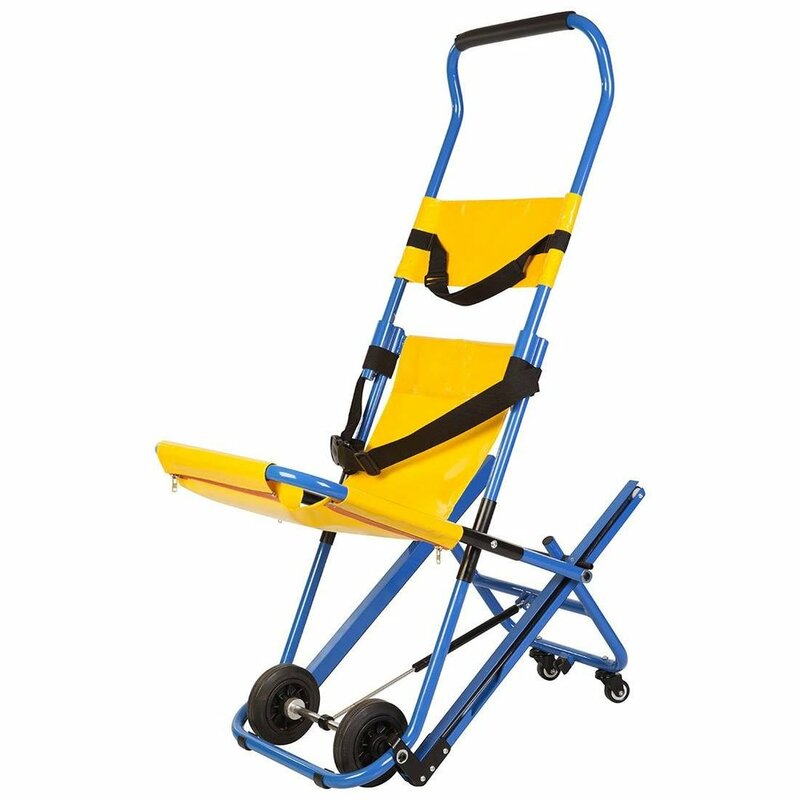 Evacuation Chairs are compact, foldable mobile chairs used to evacuate people with physical limitations down stairs. 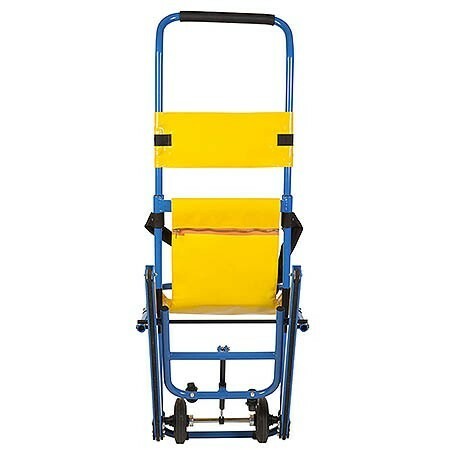 The EvacuLife Escape Chair has rubber tracks and a breaking system to allow for a controlled decent down stairs, and an additional brake when stationary. The seats have adjustable safety straps to secure the person to the seat during transport. Evacuation Chairs may be useful for large building complexes like hospitals, aged care facilities and apartment buildings to assist with evacuating anyone with limited mobility – from anyone with a leg in a cast to those with permanent physical limitations. Where are Emergency Evacuation Chairs useful? Evacuation Chairs can be provided in any buildings or complexes where stairs (indoors or outdoors) may cause life-threatening problems in the case of an emergency evacuation. 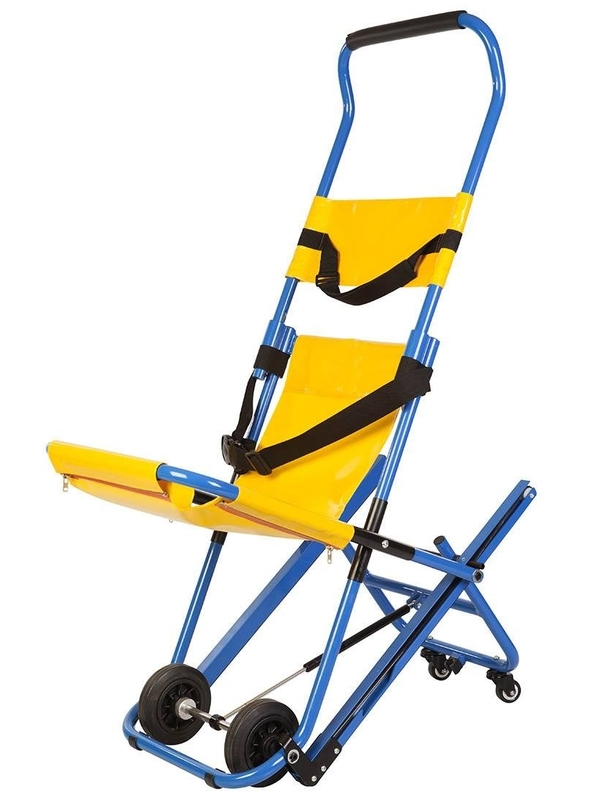 Organisations that may find Evacuation Chairs useful include:Schools and Colleges, Sports Stadiums, Museums and Galleries, Aged Care Homes, Hospitals, Factories, Shopping Malls, Office Buildings, Cinemas, Libraries, Banks, etc. 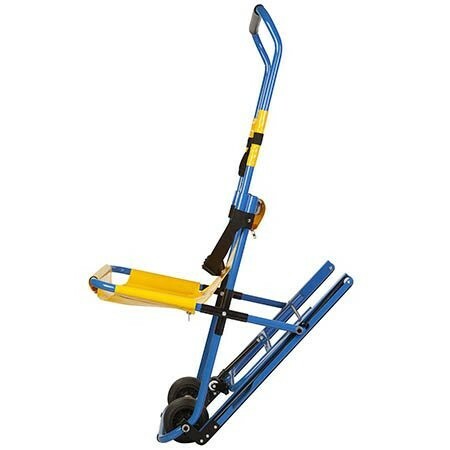 Certified Safety First Evacuation Chair Trainers provide practical training to every business which buys an EvacuLife Escape Chair using the Train-the-Trainer principles. Safety First will re-train the in-house Evacuation Chair trainers twice a year to ensure knowledge is fresh and procedures remain sound. In any emergency situation, there must be a safe and quick way to evacuate people who are less-able for any reason – they may be physically challenged or dealing with an injury that makes evacuation under their own power impossible or unsafe. Emergency staff cannot be expected to evacuate people down multiple flights of stairs in an emergency, and it isn’t wise to rely on prompt arrival of emergency staff. Your team needs to be able to evacuate the building safely and effectively. 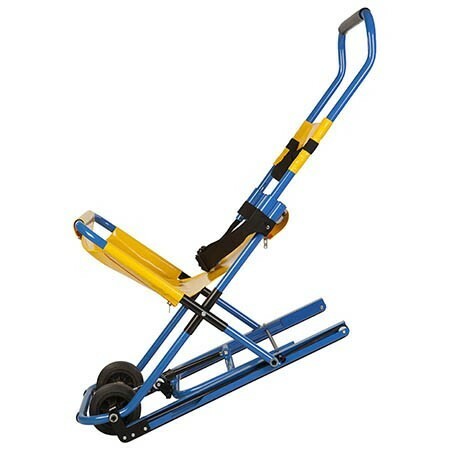 Minimum training of two chair operators with initial purchase of the chair. Training of chair operators is done in pairs (buddy-system). Training takes two hours per pair of operators. Staff members need to be fit and healthy with no back and/or muscular problems (to be able to control the chair and assist the evacuee into and out of the chair). At the end of the training, the staff members will be assessed on their ability and competence to effectively use the chair. On completion of the training, Operators receive a Certificate of Competence and a quick-reference guide each. Ask about the EvacuLife Escape Chair now. Do you need to refresh your organisation’s Emergency Management Procedures or Fire Evacuation Plan? Emergency Evacuation is a huge priority, and need to incorporate staff of all abilities. Talk to our Evacuation Planning team about your organisation now. We are experts in Emergency Preparedness and Fire Evacuation Plans.